Manger is a remote village located in an isolated valley of the Aravali range, 5 kilometers from the nearest state highway or the nearest village. Though only 15 kms from the teeming million and a half peopled cities of Faridabad and Gurgaon, Mangar lives in another century. The village is predominantly hardy Gujjar and some Dalit, cut off from civilization for hundreds of years till a narrow metaled road connected them to the Faridabad road as recently as a decade back. The Gujjars lived a life of subsistence on their large herds of emaciated desi cows – which continue to roam the hills and highways for fodder during the day, returning home in the evening – and desultory employment in mining for minerals in the surrounding hills. Mining was banned by the Supreme Court by a landmark judgement in 2003, protecting the forests and hills protected from ‘development’; the unceasing roar of the Tata dumper trucks came to a halt. The 5 kms of hilly forested land leading to the village is a relaxing drive though rocky and sparse, populated with kikar and other hardy local flora. This includes the Mexican Prosopis Juliflora, or Muskat as the locals call this invasive species that overwhelms all other plants. Never cultivated, the land was village commons (sometime mining badlands) and is now a green lung of many square kilometers. Only the Mangar valley of ~100 acres of flat land has adequate ground water at 30-40 feet; farmed only for home consumption. Agriculture, therefore, was never a big employer in Mangar unlike the neighboring villages of Dhauj or Silakhri across the Bund. The backwardness and isolation of Mangar led to the chemical green revolution completely bypassing the small agricultural holdings of the valley, and all land mostly remained manured by cow and buffalo dung. Forgotten by society, eking a basic living through their cows, Mangar was dragged kicking and screaming into the 21st century by the breakneck growth of Gurgaon. There is no space for middle ground in India anymore, either we have isolation and the resultant backwardness or we have complete chaos through a free for all ‘development’. Life is changing for the villagers, as rumor and fact have it, with prominent builders, politicians and bureaucrats licking their lips and making deals around profits in the tens of thousands of crores of rupees from hundreds of acres of land currently protected by Supreme Court rulings. The Congress government issued earlier in 2013 a ‘long term’ Development Plan 2021 that (surprise!) allows tourist resorts to be set up in on large tracts of forest and protected land to ‘help the local economy’. The ancient Mangar Bani (a ~250 hectare forest of the indigenous Dhau tree, and a key source of underground water recharging for the NCR ) will soon have a Disneyland – owned and managed by the rich and powerful. Welcome to the roller coaster ride that is development in India. No surprise, then, that the Mangar village is overwhelmed by greed and is part of the violence of new money. Land that was worth 1 Lakh an acre a decade back now sells for 1 Crore. The Mangar villager wants a part of the high rise life – the satellite TV, the motorcycle and SUV, the mobile phone, and the ‘English’ alcohol. Despite the weight of the depressing present, the view is truly breathtaking when you come upon the Mangar valley. The Mangar school is on your right just before you reach the point from where you descend onto the village and into the valley. We connected with the local school after settling down at Aman Bagh, in late 2012. 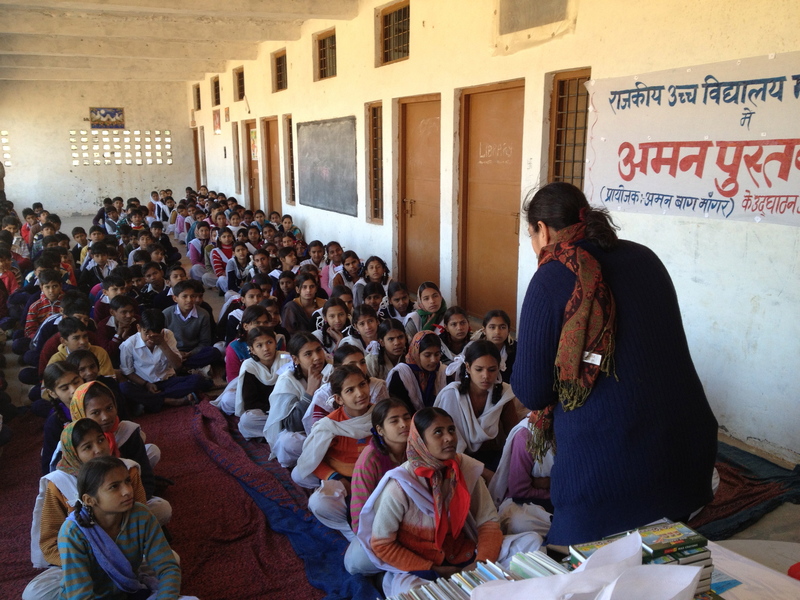 The school is dedicated to the village, and has about 500 children. The school is like many others in rural India – without adequate infrastructure, or teaching and administrative leadership of any value; compounded by the backward approach of many of the villagers. For example, the dropout rate after the 8th grade : from a 50-50 ratio, girls drop to less than 25% in Grade 9, obviously, lost to early marriage. Some of the more affluent villagers send their children to private schools in Faridabad (15 km away) than to this one located right in the village. I doubt if the children in the private schools learn that much more. In any case, there are no jobs to be found only frustrated new ambitions. 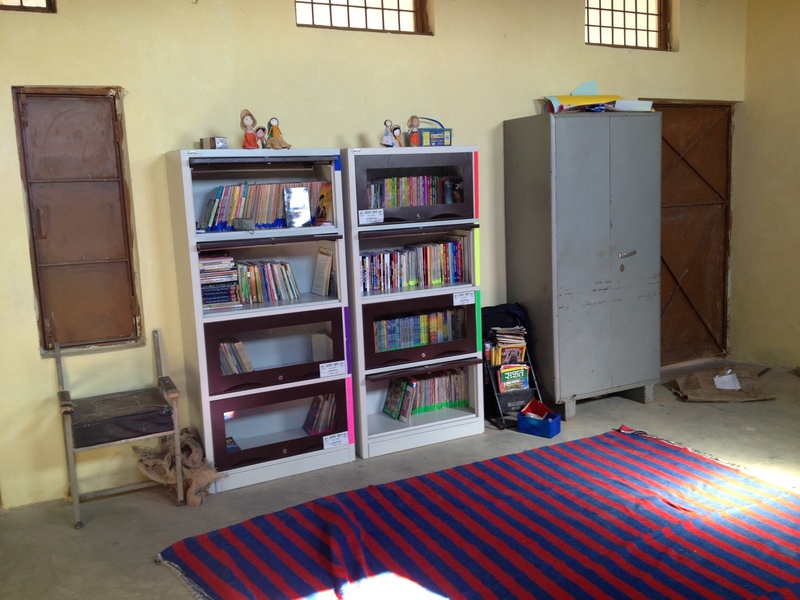 We met Vinod, a young teacher at the school, who is motivated to make an impact in the lives of the children; and we cleaned up a room designated as the library. We had already connected with energetic and committed Nadira Chaturvedi who runs a free ‘Aseems Library’ in Delhi in the name of her son who she lost to cancer while in his twenties. She helped us buy the right storage shelves, the durries, the low height tables, the right books, and her simple yet effective library management systems with Vinod on how to track & encourage book issuance. 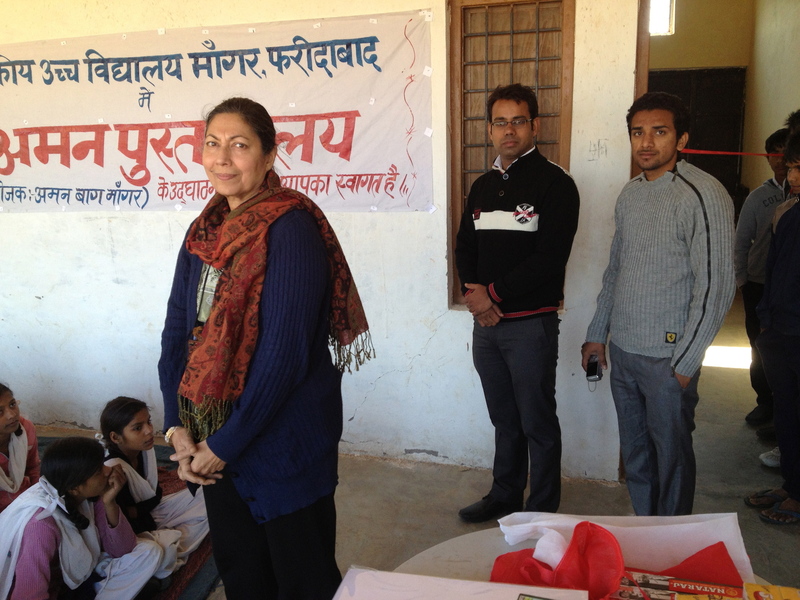 She insisted on making reading fun for the children, and ensured we gave out drawing paper and colors when the inauguration of Aman Pustakalaya took place in December 2012. There is much yet to do, as school politics reared its head and Vinod was removed from managing the library as ‘he had too much to do’. But a beginning was made, and the children have taken to reading. The most enthusiastic readers were identified over some months and were sent – together – to the Book Fair at Pragati Maidan : this was the first visit to Delhi for most of them. Very noble efforts. Will surely make a positive difference. Best wishes. Very good idea. How is the library going? Please share an update. Is it accessible to non-students? If not, could it be located/have a sub-section at more centrally located place along with special exclusive timings for women. I know this will require more managerial resources but is worth the effort. And are more books being added regularly to keep up the interest of more enthusiastic readers? 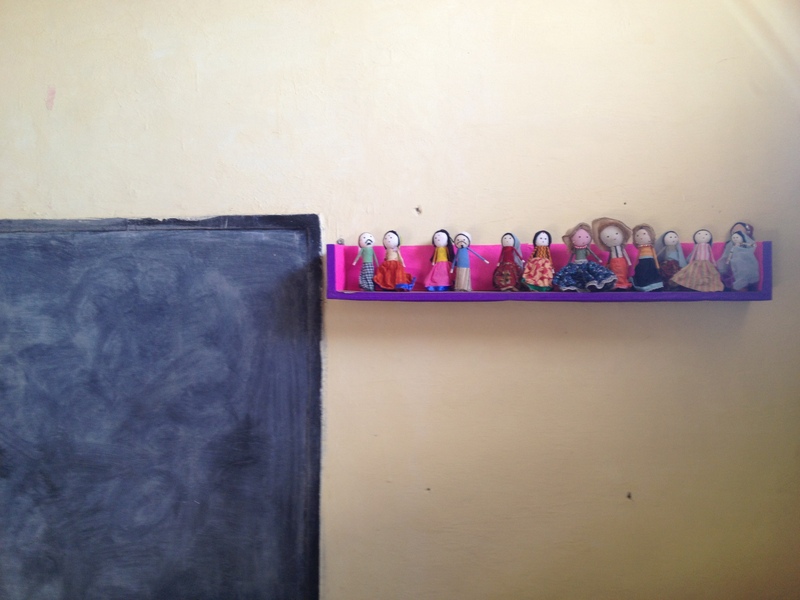 Rajinder, the principal of the school kept the cupboards – meant for more books – in his office and he demoted the teacher who was leading this effort. 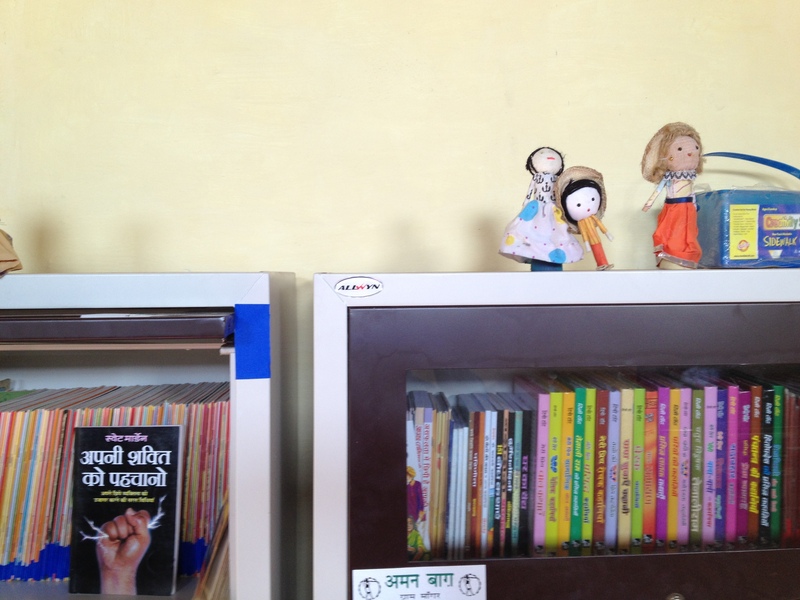 School politics led to the children library being neglected. A new principal has been posted now, let’s see. What an article Vinod. So honest and virile. It touches the deepest chords of heart.